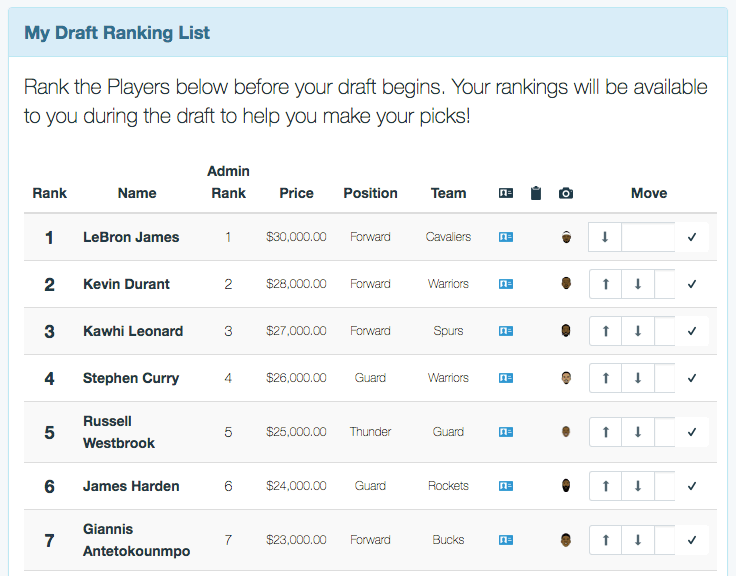 OnlineDraft will make your Gaming or Fantasy League Draft easy, efficient, and fun. Setup is simple and it is free to try. The Draft is similar to fantasy sports drafts with all the features your league needs to draft teams. 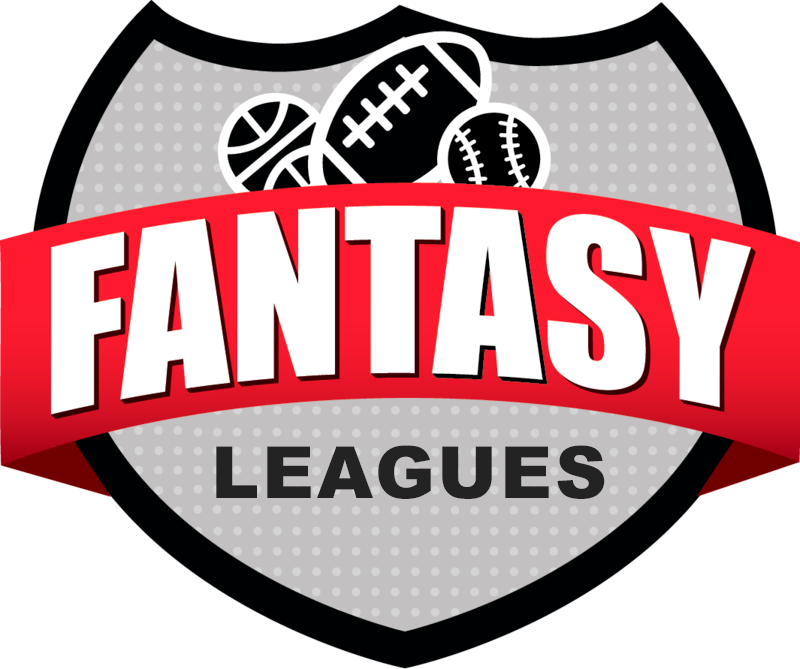 Sign up and then load the league's fantasy players from a spreadsheet. You can even add player photos. Add your coaches and then enter your draft details. Start when you are ready. 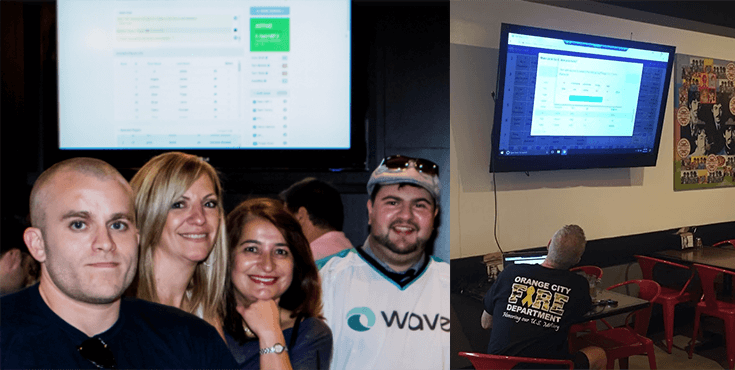 Connect the Draft Board to a TV for your in person draft. Any coach can access the draft remotely from their device. Let the games begin! OnlineDraft works great for any fantasy league where your group needs to select players, or people, or things to form teams. For example you can draft: NBA Players, MLB Players, NFL Players, NHL Players, WWE, Pokemon, the Bachelor / Bachelorette, Magic the Gathering and more. TV / Gaming personality Dan Gheesling used OnlineDraft to host their ResinRivalry Smash Draft. All of his followers could join the draft in real time. Here are the Publc Draft Results. Load your fantasy players, people, creatures, or whatever you are drafting. Participants can rank their picks before the draft begins. Participants can see all the draft details when they are making picks. If your group needs to assign prices to your draft items, real-time per partner totals are available to show how much has been spent. Team rosters are ready as soon as the draft is finished! It takes just a couple of minutes to load your players into our system from a spreadsheet. Include up to 5 customizable fields per player plus an optional Admin Rank and contact info (only available to assigned coach). Connect your laptop to a TV and run your draft from the draft board . 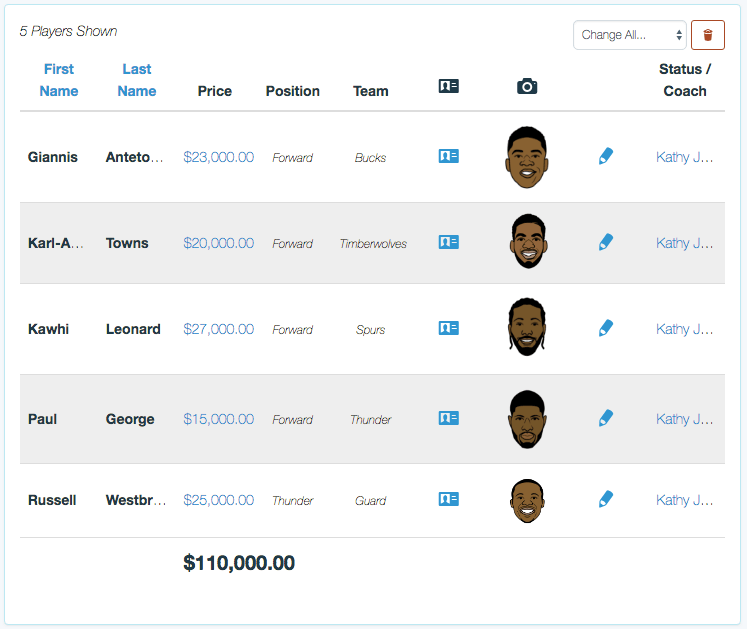 Each coach can use their own device to see a list of available players updated in real time. You can also pre-select or "slot" players from the draft board and make sibling or buddy picks during the draft. 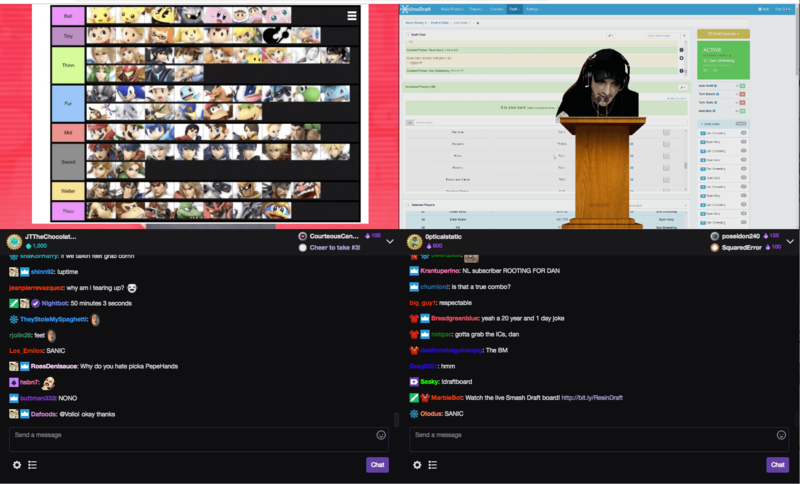 Some or all of the draft participants can be remote. If a coach cannot make the draft, they can pick from anywhere with any internet connected device. If the leagues wants, everyone can draft remotely. Having this option available makes sure that all coaches can participate in the draft AND you can keep to your schedule! OnlineDraft is terrific for in-person drafts. Connect a laptop to a TV to manage your draft. 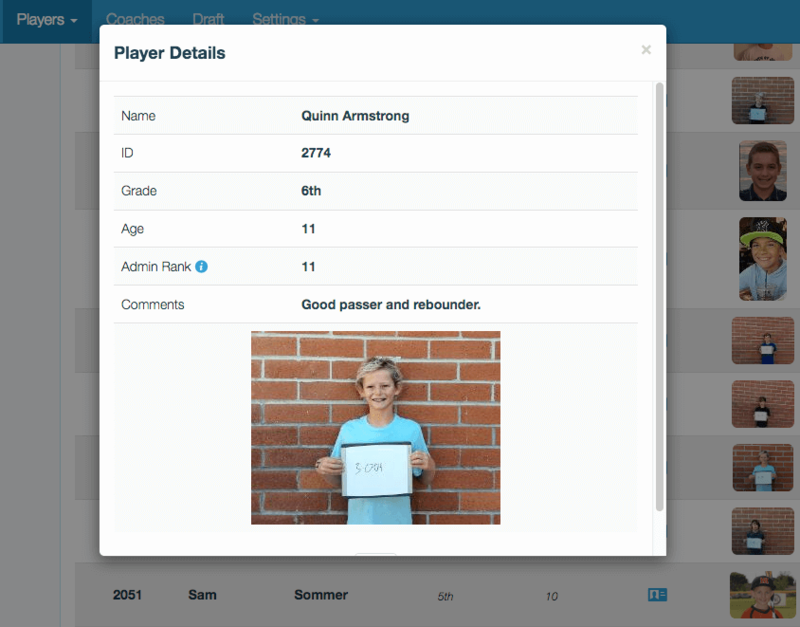 When loading your players, you can include up to 5 customizable columns plus comments and an ID. You may optionally include photos (bulk loading available) and an Admin Rank. Player details can be made available to all coaches in advance of the draft to GREATLY improve draft preparation and team parity. Using Admin Rank, your league can quickly apply a ranking order to all players. This rank can be generated by an objective party, or it can be the average of participating coaches, or it can be generated however your league wants. The Admin Rank becomes the default ranking for all players. Easily add photos for each player. Don't use little league baseball draft sheet templates! Use OnlineDraft -- the best youth / adult sports draft software! Setting up your Youth Sports League Draft is a snap. Just sign up, and then enter a name for your group. Then load your players from a spreadsheet and configure your draft. It is FREE to sign up and get started. 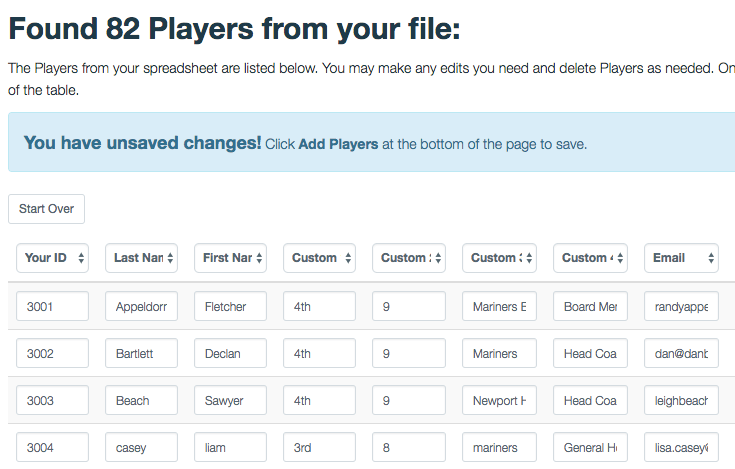 Import your players from a CSV file. You can export your players from your registration system and quickly upload you players into OnlineDraft. Include up to 5 additional data columns plus comments, email address, and phone number. OnlineDraft works great either way. If all of the coaches meet for the Draft, connect a laptop to a TV and use our DRAFT BOARD. OnlineDraft will simplify the process whether your Draft is In Person, Remote, or a combination of the two. You can pre-assign, or "slot" players before the Draft begins. Once you have set your draft order, you can make any selection in the Draft before it begins. If certain players need to go at certain picks, we have you covered. Sometimes picks come together. For example, when you pick a player with a sibling then you may need to pick the sibling in a later round. From the DRAFT BOARD it is simple to assign any player to any pick in the draft. Administrators can start, pause, resume, and end the draft whenever they like. Further, the Administrator can pick for coaches and enforce pick time limits. All player details are available to Coaches in a List. Rosters can be downloaded to a spreadsheet after the draft. 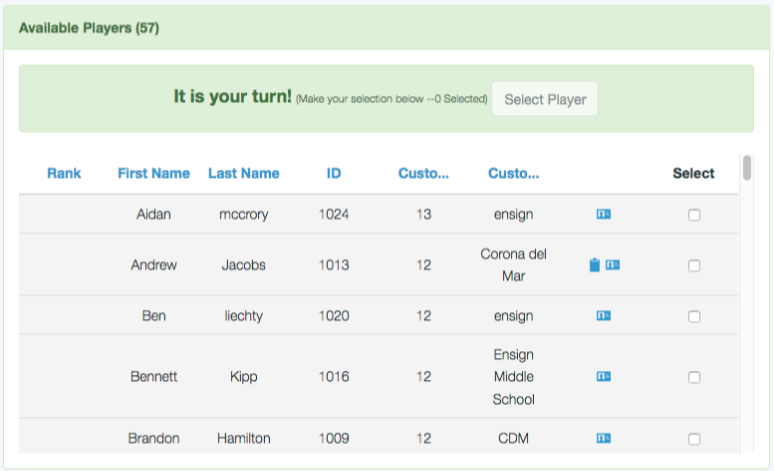 When loading your players, you can include up to 5 customizable columns plus comments and an ID. You may optionally include photo (bulk loading available) and an Admin Rank. Player details can be made available to all coaches in advance of the draft to GREATLY improve draft preparation and team parity. You can optionally assign an Admin Rank to each player. This is a league player ranking available to all coaches / managers. If Admin Rank is set, it is the default for AutoDraft. 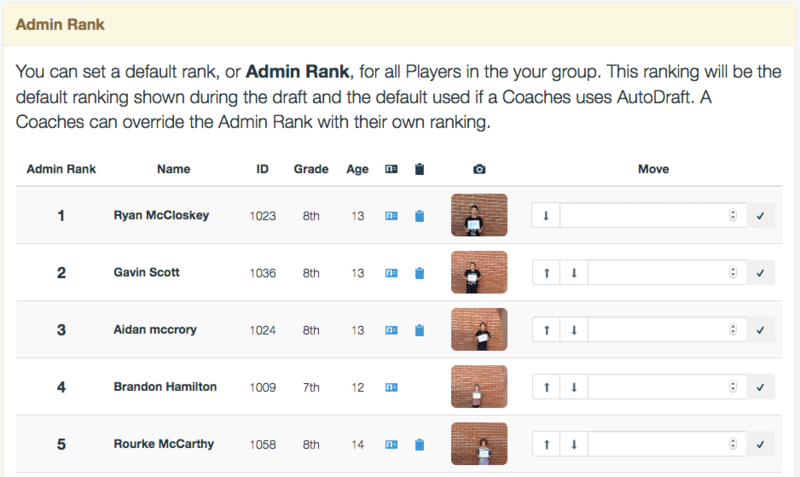 Coaches can override the Admin Rank by setting their own, private, rankings. Before the draft coaches can rank all of the players. At the draft, all of their ranks are available to help coaches make their selections. 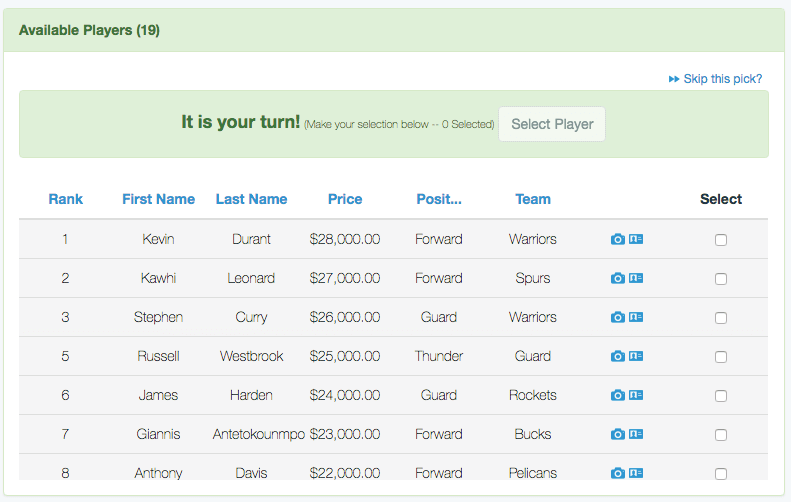 AutoDraft can be turned on at anytime to have the system pick for you based on your rankings. Can player information be confidential? Yes! Email and Phone fields are locked and only available to the Administrator and the assigned coach or manager. In addition, the Administrator can choose to lock some of the player data so that only the core details like name and ID are available to all coaches/managers. Once a player has been selected by a coach, the data marked as confidential are made available ONLY to their coach. This settings allows your league to protect the privacy of all your participants and their familes, while adding the convenience to your coaches by making rosters available with all the details needed to contact their new team immediately after the draft! OnlineDraft works great for leagues with multiple divisions and drafts. Often players not selected in a draft need to be added to the next draft. With OnlineDraft you can easily import the undrafted players into the next draft. After any draft you can use the "Trade" feature to quickly trade players. A record of the trade is added to the draft log. Coaches can choose to receive an email and / or a SMS (text) message whenever it is their turn to make a pick. Notifications will keep your draft moving. As soon as the draft is finished, each coach can download their roster to an EXCEL Spreadsheet. If you include email address and phone number, coaches will have everything they need to contact their team as soon as the draft is finished. If you wish, you can add player photos. 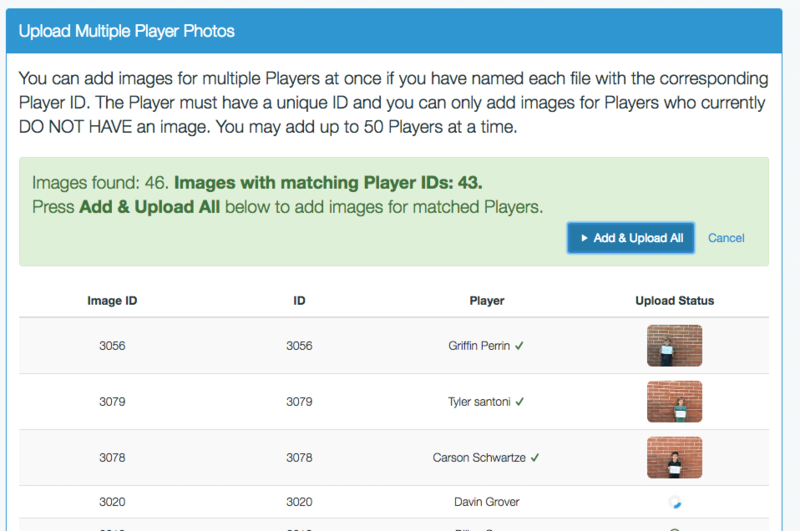 Add photos individually or upload in bulk using your assigned player IDs. Photos are available to rank players and during the draft to help decide who to pick.